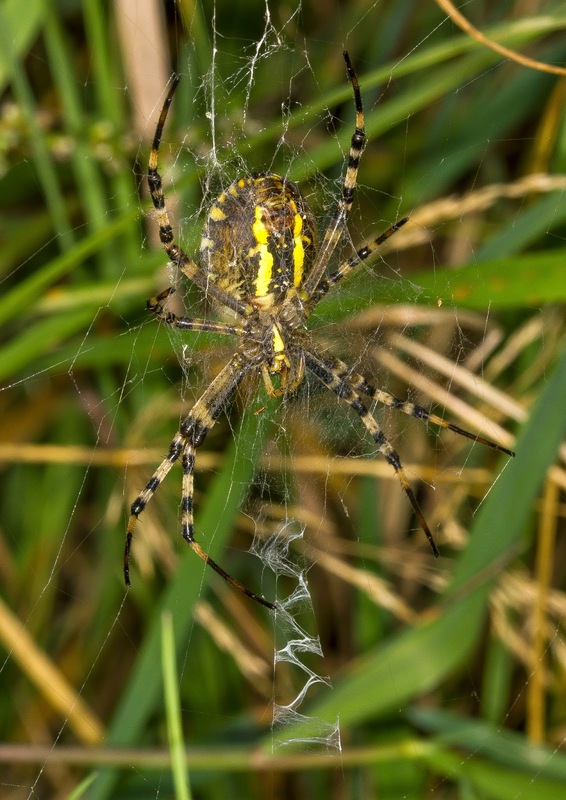 I have been wanting to see a Wasp Spider for years now but despite lots of searching around here in Northants I have drawn a blank. It's not surprising really as despite them being reported this far north on a couple of occasions by a lucky few they remain a southern species. I spent a while searching the sand dunes at RSPB Minsmere a few years ago when the juv King Eider was there but I couldn't find any and the lure of the rarity out to sea proved too much and I had to abandon the spiders to chase the King up the coast instead. 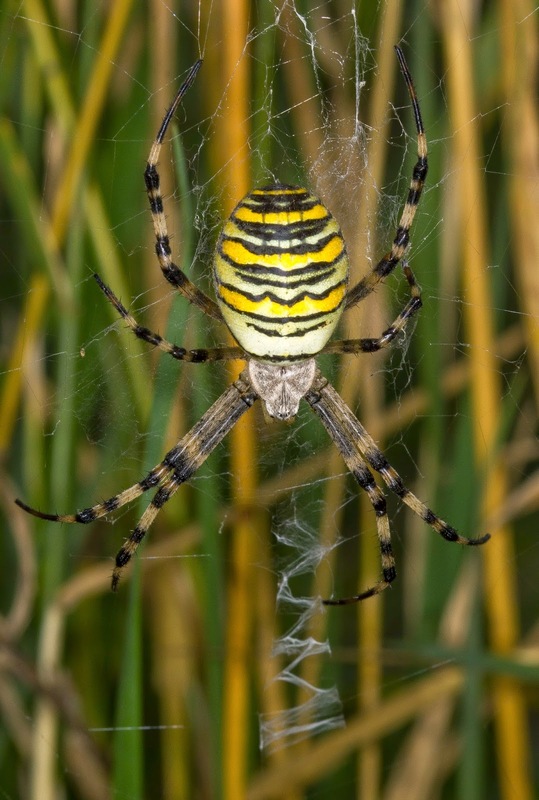 Every year though especially in September my mind always draws back to them so I was very pleased when browsing Twitter when I saw a picture of a stonking female Wasp Spider at a site near Aldershot on the Surrey and Hampshire border called Tices Meadow. I spent the rest of the week trying to decide whether it was a good idea to drive all that way to see something that could very easily not be there and not only that but trying to search a large site that I am totally unfamiliar with trying to find a relatively small spider started to make me think it was a fools errand. I had actually decided against it but my wife unexpectedly got one of here car tyres puncture d while she was visiting friends in Watford and as the locking wheel nut key was up here at someone else house (long story) I had to take it down there to change her wheel. After I did this I sat in my car and checked the map to discover I was actually half way from Northampton to the Wasp Spider site so I decided to give it ago and I drove down to Aldershot with rather pessimistic thoughts going round in my head. I found the road (Lower Farnham Road SU867490 ) and parked up at the bottom and using my OS map app on my phone located the entrance to Tices Meadow (gated path on the left) and followed the paths through the scrub. Thanks to Lee Evans on Twitter I knew I had to find the "viewing mound" to find the spider and after walking along a small path that headed through one of the bushes I could see a lot of people standing on a mound further east so I made my way over. A Pectoral Sandpiper had been discovered here recently and it was drawing in quite a crowd of birders to see it so I approached them checking all the grassland on either side of the path. It became clear that it was going to be easier to ask a local as it really was going to be a needle in a haystack job in all the grassland. I'll admit I did feel a bit daft approaching someone to ask the location of a spider but I found a chap and popped the question. He then very helpfully span round and took me to a clump of grass and in the middle of it was one of the best looking wild creatures I've seen in Britain! Hanging in the middle of a web was a stunning female Wasp Spider and I have to say she was a lot bigger than I was expecting here to be. It really was a dream realised as I grabbed the camera and snapped away with one hand while trying to clear away the grass with the other. The web is also worthy of mention as it is just as impressive as the spider. The web includes a distinctive zig zag pattern below the centre which is called a stabilimentum and no one knows exactly what purpose it achieves. 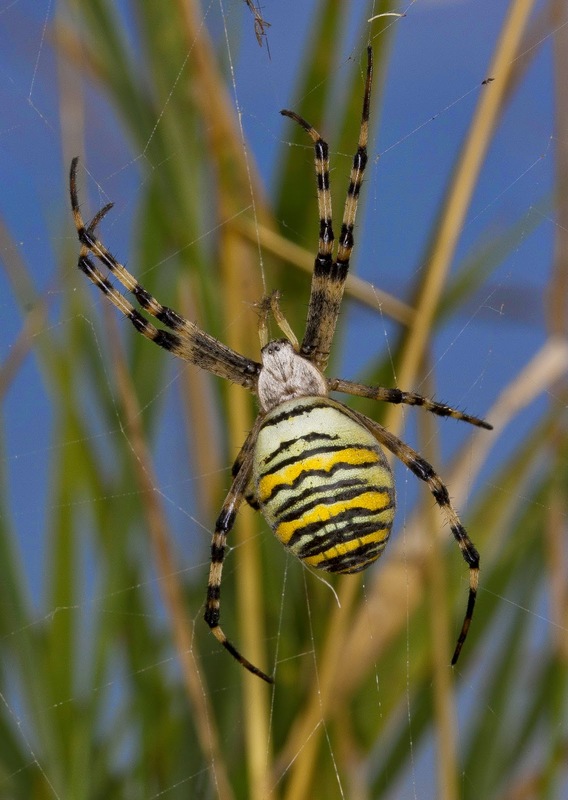 It used to be believed it was for web stability (hence the name) but it is also now considered that it could also be an aid to hunting, a camouflage technique or simply just decoration. Either way a stunning spider in an equally stunning web had me awstruck with this creature and it was nice when I was joined by a few of the birders and their children who had come over to see why I was taking so many pics in the grass, quite a few of them went back to their bags and returned with their camera! But anyway that's enough waffling from me so here's some of my pics of her. After getting my pics I really had to tear myself away and after saying goodbye to the birders I made my way back to the car checking the pics on the back of the camera on the way. 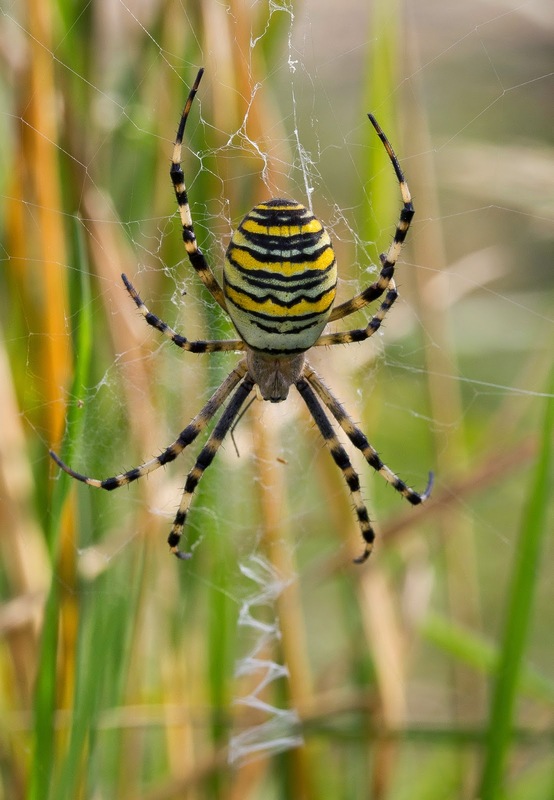 At last I've seen a Wasp Spider, and what a stunning specimen to see too! I was half way home before I realised that I hadn't even bothered to look at the Pectoral Sandpiper, my interest in insects is becoming a real priority with me at the moment and the birds are beginning to take a bit of a back seat in my wildlife watching and I am really broadening my interests - it's amazing what's out there if you look hard enough!